I will suggest you to use TinyGPS to connect only via GPS and get the position, make sure you are testing outside with good view of the sky or the gps will never get a lock down. Then when you are familiar with TinyGPS and how to get the location, add the GSM module to send over this information to your mysql server. 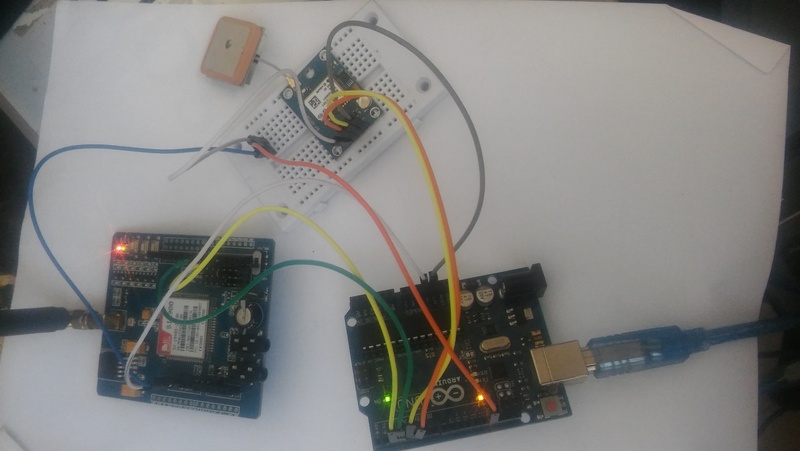 I think you are searching for a solution like this Interfacing GSM and GPS Module using Arduino where GPS and GSM modules can run together and receive data at the same time. I tried bringing up both inside setup() and it blocked the other device. Here is some extract of the code (Note that rx,tx and baud rates may differ according to the modules). If you look for an advanced way of handling this situation, you may need to implement some light-weight threads (e.g Protothreads) and assign GPS and GSM modules to run in separate threads, so one device may not block send/receive of the other device. These Arduino forum answers may help for such approach. Not the answer you're looking for? Browse other questions tagged arduino-uno gsm softwareserial gps or ask your own question. How can I create multiple running threads? Can I use GSM and GPS modules at the same time? How to connect GPS Neo-6M module to GSM Shield SIM900 V2?